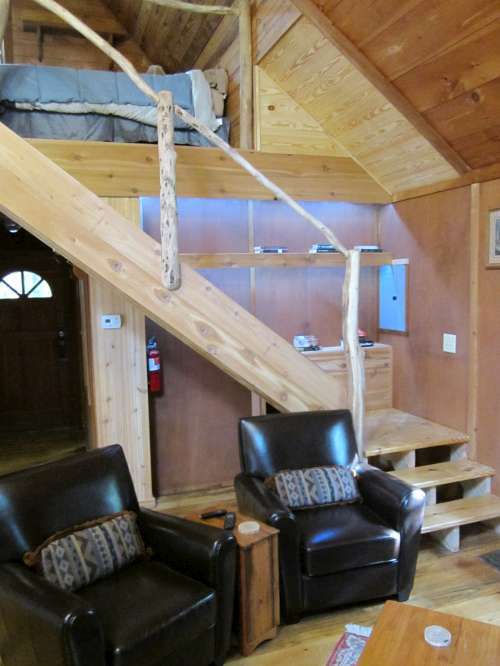 Come stay in our Spotted Rock Cabin! 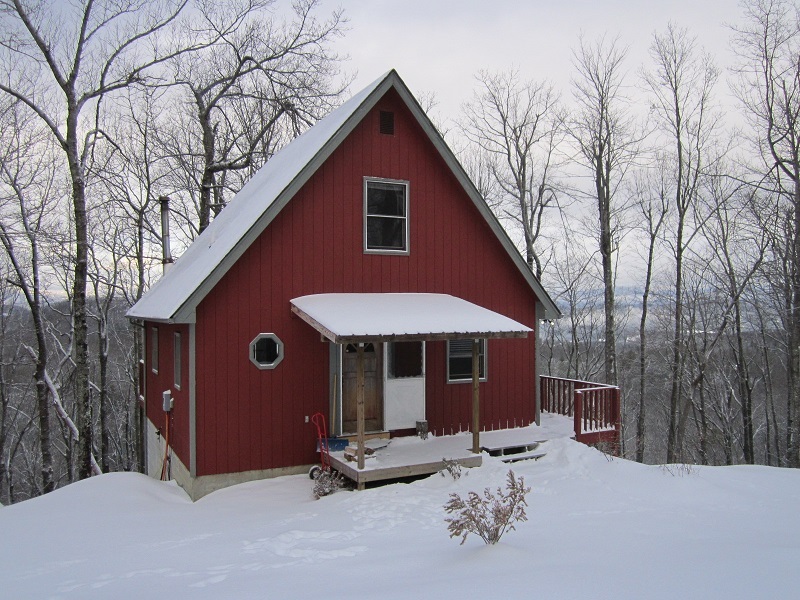 Our quintessential red cabin is a two bedroom, one bath cabin built high up on a mountain ridge with views extending far off towards the Smoky Blue Mountains and the Blue Ridge Parkway. With views facing west, watch the sun set from the deck while relaxing in our rocking chairs and sipping a glass of wine. 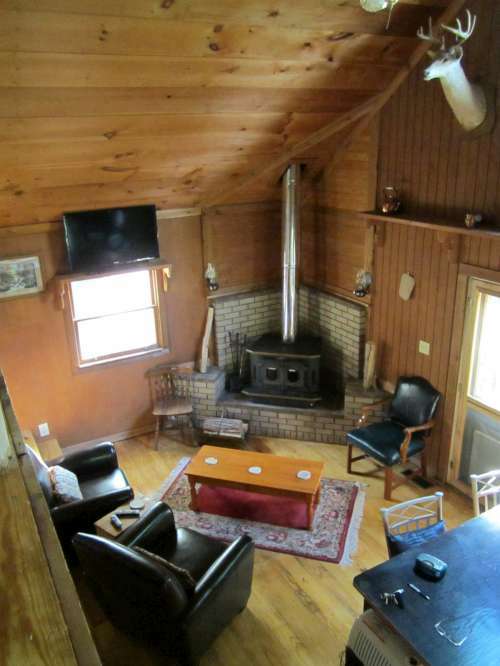 At three thousand feet, get away from the summer heat, enjoy our rustic wood stove fireplace in the evenings and hike through the hundreds of acres of surrounding forest. 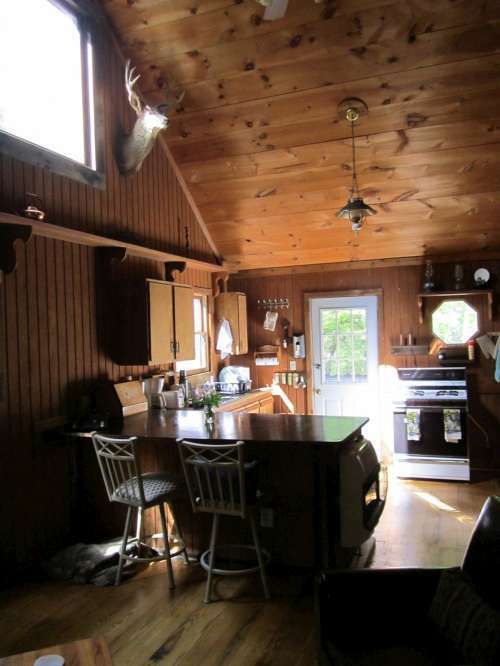 Built around thirty years ago, the shack with its two compulsory mounted deer heads looking over the living room and loft will feel like your home for rest and relaxation. 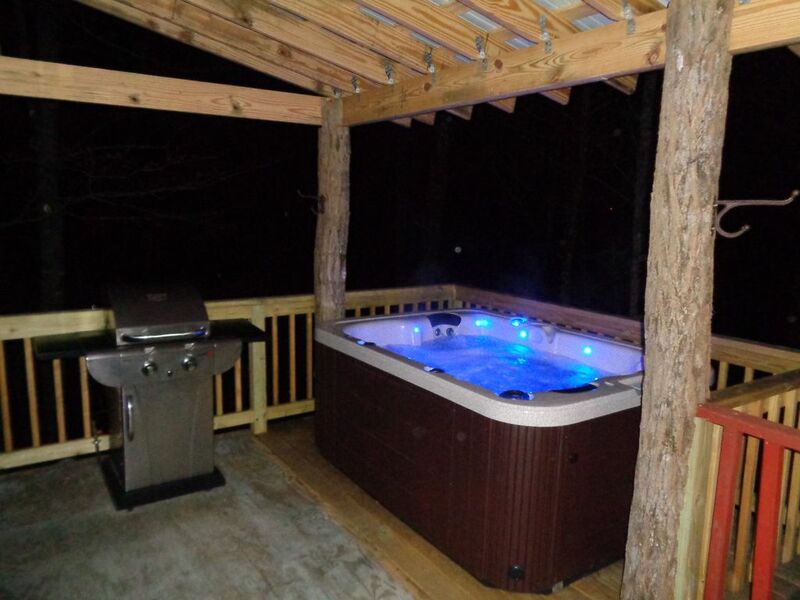 Enjoy the hot tub if your bones hurt! When raining, relax under the back porch roof and enjoy the weather. Don't look for the granite, you wont find it, but do bring your laptops as there is high speed internet available, and a wireless printer/scanner all ready for your office away from home. If you stay in winter, we have a heat pump, and if it is a rare hot day in summer, enjoy the AC. We have many year's supply of wood for your enjoyment of the wood stove fireplace! 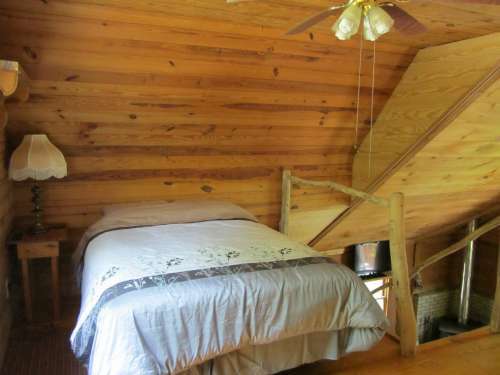 Feel your blood pressure fall as you drive up to the top of our mountain ridge, passing through the security gate to reach this exclusive mountain top where you can rest easy knowing you are in the coziest cabin here. You cannot see your neighbors, they are a good walk away. 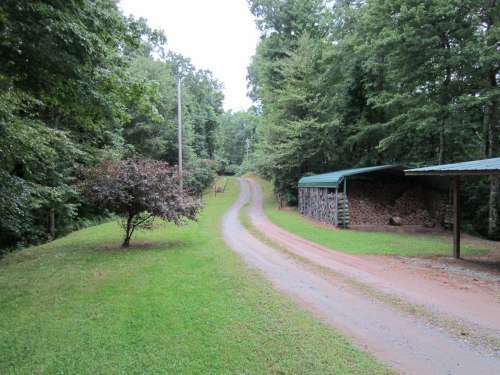 Perfect for strolls, and seeing the deer that roam around and feed on the grass. When you want to stay in, enjoy our TV with Netflix and ROKU with HDTV channels too. See the Area: Shop for antiques or groceries in Brevard NC which is 20 minutes away. Dine at the pleasant Red Lion Inn, at the bottom of the mountain (1 mile from your rental cabin). Fish at our local lake, which is within a mile or if you like hiking through the woods, straight down the mountain. See the spectacular mountain meadow waterfall within two miles of your cabin suitable for all ages and abilities. The Transylvania county area is called the 'Land of Waterfalls' for good reason as there are hundreds of waterfalls all around. Visit one of the five state parks that surround the cabin, drive to the Blue Ridge Parkway, in about thirty minutes, dine at the fabulous Pisgah Inn restaurant (58 min from your cabin) overlooking the entire area. Visit the Biltmore House (1hr 19min from the cabin) for a day of seeing how you will never live. Go to the Asheville Farmers Market (1hr 5min) and pick up fresh produce...so you can be healthy. Visit Asheville (1 hour) and dine at one of the many restaurants in downtown, knowing you can escape back to your cabin when the artists wake up. Slide down the rocks at Sliding Rock (30 min from our Brevard Cabin), go to Pisgah National Forest, Hike in The Great Smoky Mountains National Forest, Go fishing in the Nantahala National Forest, pick-nick in the Table Rock State Park, drive through the Ceasars Head State Park or view deer in the Chattahoochee National forest. If scenic drives is your thing, Route 64 passes right by, and is one of America's most scenic highways with a car-stopping waterfall or view about every .02 miles. Have your brakes checked before you go. Take a day trip to the quaint town of Highlands (1 hour from the cabin) where most of the ferrari's and bently's west of the Mississippi will be found. Drive past one of the many country clubs near Cashiers (45 min) and Lake Toxaway and the Greystone Inn (25 min), knowing that you would have to sell your house to pay the entrance fee to become a member. Pick-up that nagging relative at the Asheville Airport (54 minutes from your Brevard Rental Cabin)....yes, with all that nagging, it's a day trip! Take a tour of the Pisgah Astronomical Research Institute PARI (30 min) to see their huge radio telescopes and to learn how they transmitted the words 'one small step for man and one giant leap for mankind' to us slugs at home on our couches while Armstrong got some exercise strolling about the moon. Visit Hendersonville (56 min from the cabin) and stroll down energetic main street on Friday evening. Lastly, have breakfast at the Country Skillet in Rosman (11 min from the cabin) so you can be among other folks like yourself and work on that belly fat that we soooo need to be hiking off. 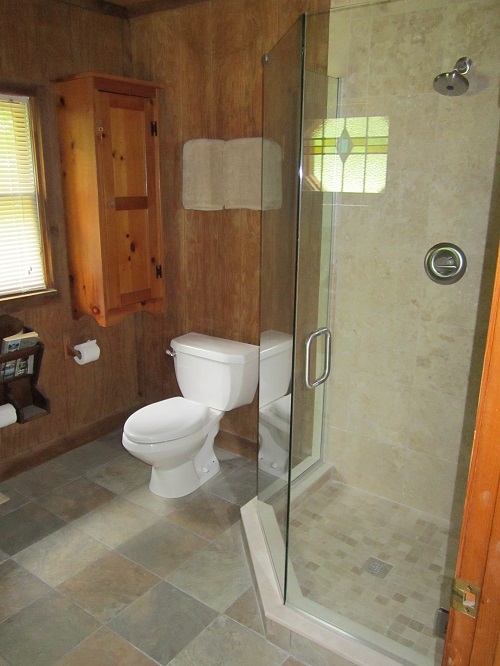 Our rental cabin is pet friendly, and is outfitted with all you need for a great vacation in the mountains, summer or winter. The area is a phenomenal place to visit year round. Click on the link below to see our rates and availability. Call or email if you have any questions. 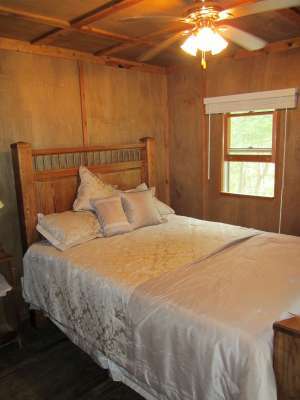 Come and stay at our Spotted Rock Cabin!